For a long time, we only heard bits and pieces about Alex Garland’s directorial debut, Ex Machina, which already sounded promising enough to grab our attention. Then there was a brief flurry of activity as it found a distributor, announced a release date, unveiled some artwork, and unleashed a trailer in a relatively short span. After getting our first real glimpse, it became one of our most anticipated movies of 2015. It looks stunning and tense and moody, and all of that is on display in this new clip for robotics thriller. This may be Garland’s first time in the big chair, but his track record as a writer includes the likes of 28 Days Later, Sunshine, and Dredd, among others. The difference is, this time he gets to bring his words to life exactly as he wants, without filtering them through another artist. And from the look of things, he’s done a bang up job. The story centers on a young computer programmer named Caleb Smith (Domhnall Gleeson), who wins the chance to spend a week at the isolated mountain retreat of the reclusive head of the Google-esque company where he works. Nathan Bateman (Oscar Isaac) informs Caleb that he will be the human component in a Turing Test, which determines the true capabilities and consciousness of his latest invention, an artificially intelligent robot. Bateman’s creation, Ava (Alicia Vikander), is a gorgeous A.I., who proves to be more sophisticated, and perhaps more deceptive, than anyone envisioned. This clip lays out the basic premise, though we don’t have the opportunity to meet Ava. It also touches on one of the big themes they’re pushing, the idea of playing god and overreaching. If we’ve learned anything from science fiction over the years, it’s that these attempts of humans to become deities rarely pan out as they hope. You can’t help but get a distinct feeling that there’s more going on than meets the eye, that Bateman is not being entirely honest, and the set up of this scene gives off a definite Blade Runner vibe. From what we know of Ex Machina, there are basically only three character, Caleb, Bateman, and Ava, and their shifting alliances and allegiances form the core of a tense, taught sci-fi thriller, which is just fine with us. This is a minimalist approach, but the isolation, psychological pressure, and the sweeping exteriors could prove to be a powerful combination. 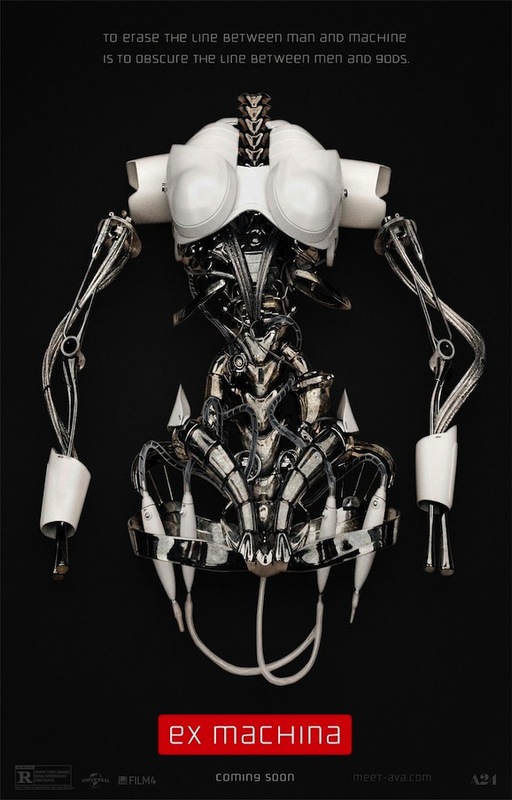 Ex Machina is already scheduled for release April 10, 2015, but we wouldn’t be surprised to see it pop up at one of the big early in the year film festivals to drum up additional hype. Sundance has already announced most of their lineup, but a South by Southwest appearance doesn’t seem like too big a stretch, not that most of us will get to see it before April wherever it premieres.